For a long time, I didn't know how to cook. Yes, I could whip up something so the blokes wouldn't starve, but I didn't know how to go about cooking and making dishes, etc. That's how I used to term myself an undomestic goddess, especially in the kitchen. Then something happened. I found not cookbooks, but books about cooking. The basics that teach you how to approach the science of cooking. It all went crescendo when I decided to write the story of a chef (Transient Hearts, my upcoming Western Escape multicultural romance from Decadent Publishing.) I never go into a story without doing extensive research first, and to portray a chef, I had to learn how to cook. Little by little, as I discovered techniques and put them into practice, I came to find that I didn't loathe cooking....once I knew how to do it and what I was doing wrong. As unbelievable as it sounds, I started enjoying cooking...to the point where it is now one of the things that relaxes me. I always need to have my radio or MP3 player blaring in the kitchen when I'm in there, but that's a detail. Even more unbelievable is how I've started to twist recipes and make them my own! The cuisine you'll find in my home is rather unique, and totally me. According to the guys, too (hubby & the hyenas, 14 and 10, who each can eat a horse for a meal), I'm actually quite a good cook now. But somehow, I'm still a Kitchen Klutz, hence the name of these posts. I'm getting better, but I'm still learning. Before anyone berates me for this not being the traditional/typical fajitas recipe, let me tell you that we don’t have Mexican restaurants here, let alone Mexicans who could’ve shown me what their ‘real’ food looks like. I’ve glimpsed at recipes online, and devised my own along the way. Fajitas, as far as I gathered, refer to strips of meat cooked/grilled with spices. So I’m going with this definition to describe my recipe. Our whole family recently made the move towards a Paleo-type diet. With kids in the house, it’s not always easy to keep meals 100% Paleo, and I don’t know how this type of eating can affect growing children – all the books, etc, cater towards an adult’s diet. So though my hyenas get more veggies/salads and less starchy carbs than before, they do get some starchy carbs like tortillas, bread, or rice, in smaller portions, with their meals. So some of my meals might not look Paleo-friendly at first glance, but I’ll provide ways for how to make them Paleo-friendly, how me and the hubby eat. On to the recipe. I don’t use specific measurements, so everything will be rather approximate. Also, have fun with your spices – I always sprinkle mine in liberally. Fajita/taco seasoning – as much as you want! Marinate chicken strips with half of the lemon juice, a bit of ground cumin & coriander seed mix or taco/fajita seasoning, and salt. Leave to soak up these spices for at least 30 mins. Heat a little olive oil in a non-stick pan. Don’t use extra-virgin coz that doesn’t tolerate heat well. I use olive pomace oil or mild olive oil. Add the shredded onions. Cook until it has shrunk and all the water has evaporated. Now here’s my secret tip – I love how caramelized onions make everything taste better. When all the water has dried up from the onions, I add a pinch of sugar and stir. This makes the onions caramelize faster. When it starts to ‘stick’ to the pan, then add in 1-2 Tablespoons of water or lemon juice and stir. Add the marinated chicken to the onions and cook until chicken is white throughout. Toss in the sour cream/Greek yoghurt to moisten the cooking mixture and provide some ‘sauce’. Add the sliced bell peppers and cook only until the peppers start to shrink a bit. Toss shredded lettuce, chopped cherry tomatoes, and sliced English cucumber with a pinch of salt, a pinch of sugar, 2 Tbps of white vinegar, and 1 Tablespoon of olive oil (here, you can use extra virgin). 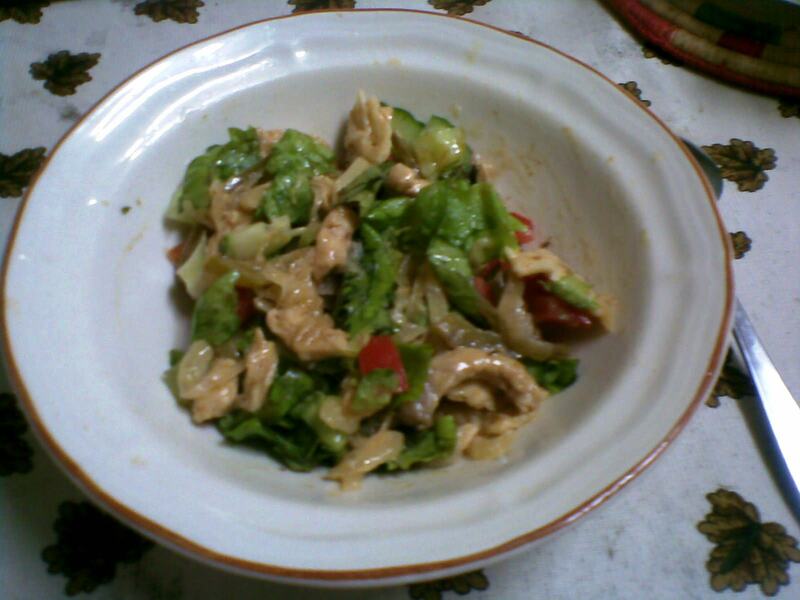 Mix the cooked chicken from above into the salad. Paleo-friendly tip – omit the sugar from the recipes, as well as the sour cream/Greek yoghurt, and you’re all set. There’s enough carbs (the non-starchy kind promoted by Paleo) in lettuce, tomatoes, onions, peppers, and cucumber to not need tortillas or another ‘regular’ carb with this one. And trust me, it is definitely filling! You can also eat this the ‘regular’ Fajita way with tortillas and guacamole. Just don’t mix the salad and let everyone top their chicken-filled tortillas with their choice of veggies. Easy, even for me, the former kitchen disaster – enjoy! Wow, Zee! We also eat Paleo except for my kids. They have turned against it because I pushed it a bit too much with them. I love this recipe! And you've given it from scratch - perfect for those in Africa who don't get things like Taco sauce very easily or affordable at the shops. I'm going to try this. Trust me, I know about kids loathing Paleo because they don't get their crack-like carbs. Mine also balk at veggies, but no can do - it's take it or leave it at my table. The from scratch - my reckoning is, if I'm gonna make it, I'll do it all the way. And yes, in Africa, we don't always get stuff like in the US or Europe so we have to come up with them ourselves. Let me know how it goes when you try the recipe!